Dynatrac is setting a new standard in brake upgrades for the Jeep Wrangler JK with the introduction of its ProGrip Brake System, designed to provide significant braking improvement during off-roading and daily-driving experiences as well as in emergency stops. 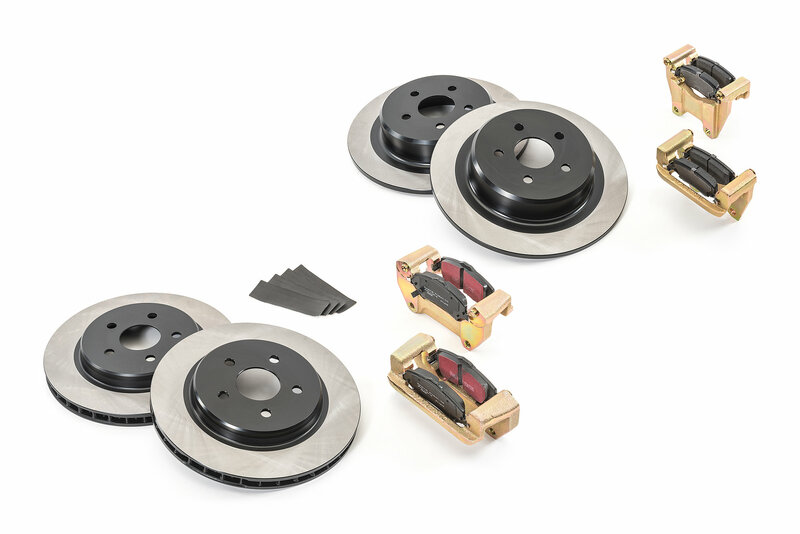 The Dynatrac ProGrip Brake System comes with larger rotors for the front and rear, providing improved braking by moving the factory calipers farther from the axle centerline. 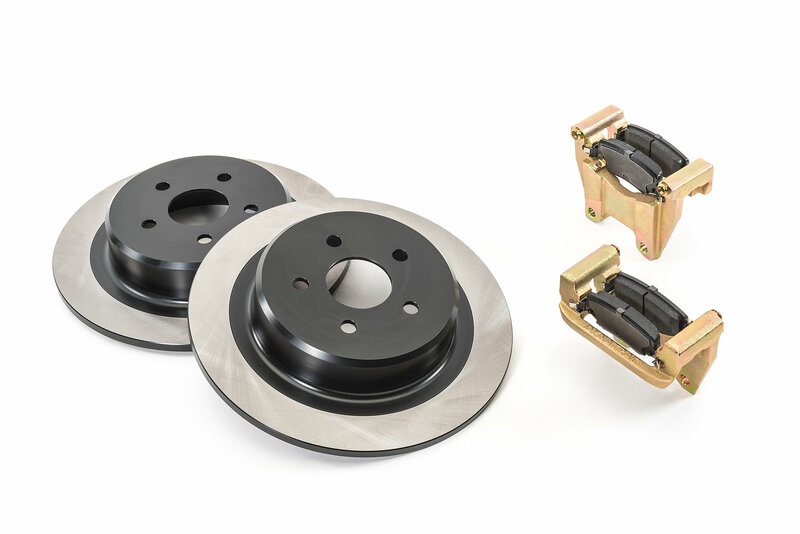 The increased rear braking power provides balanced braking, reducing nose dive and dramatically improving the control of the vehicle in mild and hard braking conditions compared to upgrades that only address the front brakes. Significant research was done to select the optimum front and rear brake-pad linings to balance the system and provide additional stopping power. Fully instrumented testing showed lower brake pedal pressure and a reduction in stopping distances of up to 30 percent compared to stock brakes on a Jeep JK outfitted with a 4-inch lift and 37-inch-tall tires. Measured G-force during moderate braking (1,000-psi brake fluid pressure) increased from 0.48 Gs with stock brakes to 0.63 Gs with the Dynatrac ProGrip system. For over 25 years, Dynatrac has been the industry leader in high-performance axle and drivetrain assemblies. Dynatrac products are designed using the finest materials, processes and engineering available, and its products are backed by the best service and warranty in the business. From complete replacement ProRock axle assemblies to high-quality replacement and upgrade components, Dynatrac is committed to delivering the best performance, reliability and quality possible. 13.50-inch front rotors with unique pillar-vented cooling design. 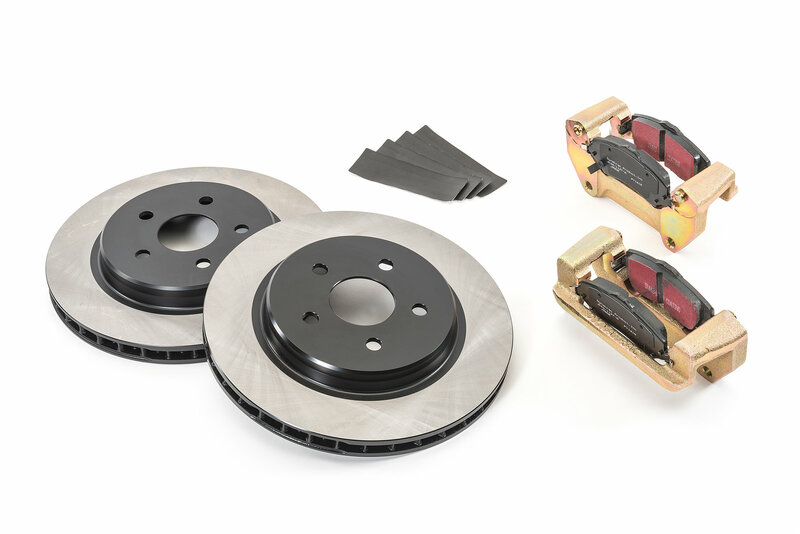 14.25-inch rear rotors with integral parking brake surface. Stronger caliper brackets designed using CAD/FEA and advanced engineering tools. Unique front and rear brake pads for optimum friction performance. I've never worked on brakes before, but these were not difficult to install being a bolt on package that does not require opening up the hydraulic system. Did the jeep 2 tires at a time in the garage with a floor jack and 2 jack stands (and wheel chocks). Instructions were good, quality is outstanding. 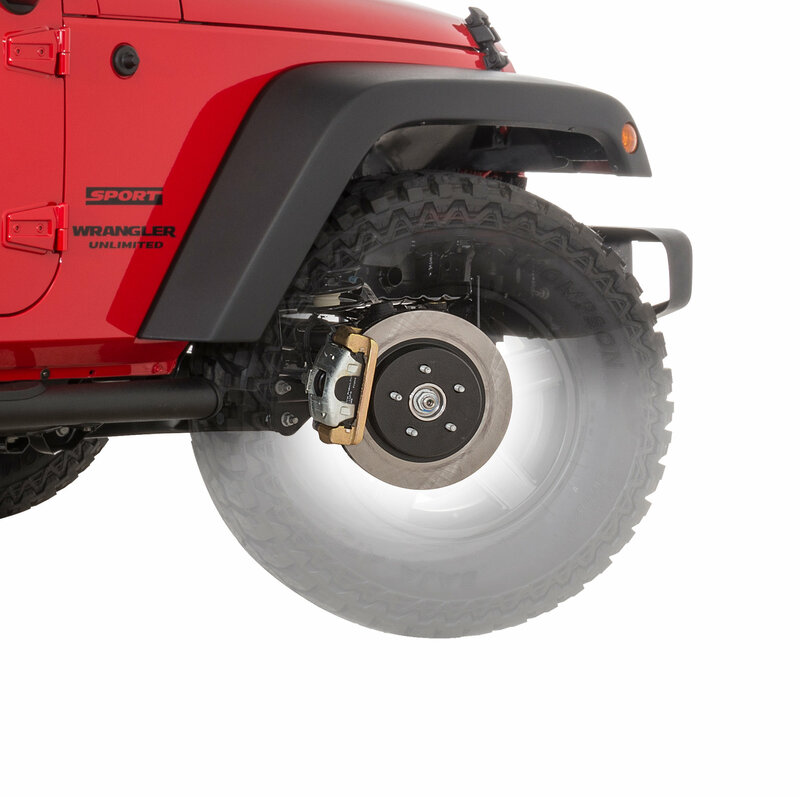 After initial bed-in procedure, there is a noticeable difference between the factory brakes on a JKU rubicon with 35" tires. They do fit with 1.5" wheel spacers and factory wheels, but calipers JUST BARELY clear the balancing weights on the tires. I purchased this big brake kit because my original rotors were warped and needed to be replaced. I live in Missouri but I travel a lot in the mountains of Colorado with my wife and two teenage daughters. We load the Jeep down with a ton of gear and or a trailer when traveling and because of this I have noticed the Jeep was taking a long time to stop and it was requiring an excessive amount of pressure on the brake pedal. Prior to installing this kit I installed a new master cylinder, new soft brake lines and new calipers all around. I ran the Jeep like this for about a week before the Big Brake Kit arrived. The installation of these new parts had little effect on the performance of the brakes. Once I installed the big brake kit, I noticed the brakes were much more responsive. It required less pressure on the brake pedal and of course the pulsing from the old warped rotors was gone. The install was simple and only took about an hour and a half. Two days after the install I loaded the family up and we went to Colorado. While in the mountains, the brakes were more than adequate for bringing the Jeep and its load down in speed for the hairpin turns in the mountains without any brake fade or any sign of overheating. I have always used lower gears when descending grades in the mountains and even with this I had managed to overheat the old rotors causing the warping. I don't see this being a problem with the big brake kit. 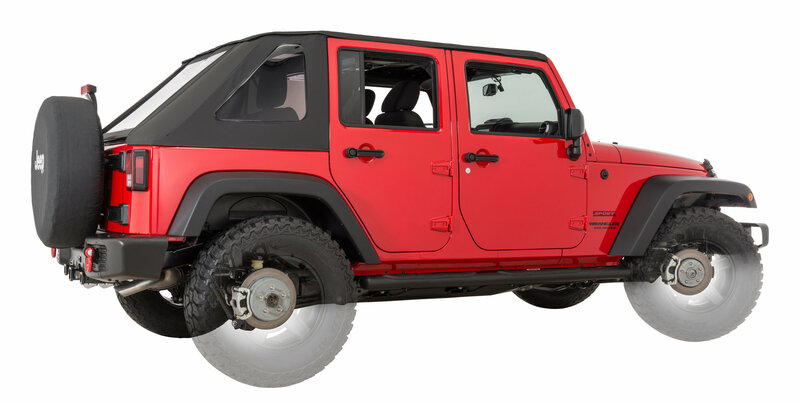 I would recommend this kit for anyone who has increased their tire size, pulls a trailer or loads their Jeep down for long trips in the mountains.